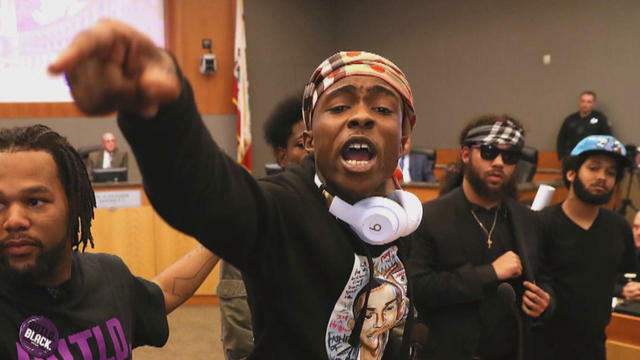 SACRAMENTO -- About 50 protesters took over the intersection near the Sacramento district attorney's office as part of a protest organized by the local Black Lives Matter chapter to urge the district attorney to file charges against the officers who shot and killed Stephon Clark. A wake for Clark was held Wednesday and a funeral was scheduled for Thursday, a little over a week after he was shot and killed by Sacramento police. Stephon Clark's brother, Stevante, approached reporters outside the Bayside of South Sacramento church and yelled and screamed for them to leave and saying they don't care about his family. Some attendees wore black shirts calling for justice, while one woman held up a clenched fist as she exited the church. The Associated Press reports that Stevante was picked up and carried into the church by a man -- but then reappeared several minutes later and was quickly carried away as he moved to approach the gaggle of reporters again. Saramento Mayor Darrell Steinberg said a community meeting that had been scheduled to begin at the same time as Clark's wake had been canceled, CBS Sacramento reports. Steinberg said he made the decision to postpone the meeting out of respect for the family. In New York City, 11 people were detained, the NYPD told CBS News. "You always feel threatened - you're a law enforcement officer, it comes with your job title," said Rahim Wasi. "That doesn't give you a right to go running around like Clint Eastwood in a movie." Sacramento mayor: Stephon Clark shooting is "also a national matter"
Tuesday's council meeting ended early due to safety concerns. Clark's brother took over the meeting by chanting Stephon's name, then jumping onto the mayor's council desk. Black Lives Matter had been planning another protest in the wake of the shooting. Activists are continuing to put pressure on the district attorney's office to prosecute the two officers who fired at Clark. A question about Stephon Clark was asked during Wednesday's White House press briefing where Sarah Huckabee Sanders said the incident was "terrible incident." The reporter asked if President Trump would weigh in on the shooting and Sanders mentioned it's "something we feel should be left up to local authorities." Sanders added: "The president is very supportive of law enforcement. But at the same time, in these specific cases and these specific instances, those will be left up to local authorities to make that determination and not something for the federal government to weigh into." In an interview with CBSN on Wednesday, Steinberg said, "I do not believe our police force is racist in any way" and "I don't think that's intended but I do think that implied racism is an undeniable factor in the way these sorts of tragedies play out -- not just in Sacramento but throughout the country."